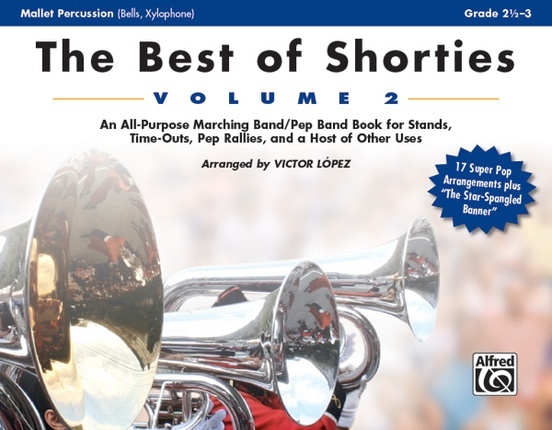 Here is a terrific compilation of some of the very best from the popular Shorties series by Victor López. This collection contains 18 short, time-out length charts perfect for any occasion. Keyboard, electric bass, and drumset parts make these charts perfect for pep band too! Titles: All Star * Any Way You Want It * Batman Theme * Blitzkrieg Bop * Celebration * Conga * Dynamite * Gonna Fly Now * Gonna Make You Sweat * Heavy Action (Theme from Monday Night Football) * Hey! Baby! * Hips Don't Lie * Jungle Boogie * Shake, Rattle and Roll * Sing, Sing, Sing * The Star-Spangled Banner * Sweet Georgia Brown * We Are Family.